The Renovator's Supply is a successful manufacturing company which brings owners, commercial property owners, contractors and retailers a variety of choices in purchasing high quality Renovator's Supply restoration hardware, bathroom sinks, bathroom faucets, High Tank Chain Pull Toilets, dual flush toilets, furniture, lighting and more since 1978. For customer service inquiries or to initiate a return, please contact The Renovator's Supply at cs@rensup.com or 1-800-659-2211 or 413-423-3300. You can initiate a return for new and unopened items within 60 days of delivery for a refund. To qualify for a refund, items must be in new and unused condition with all original materials and/or accessories. If a return is not received at our processing facility within 60 days, it may be subject to a partial refund. You will be responsible for return shipping costs. However, if the return is a result of a fulfillment error, product defect, or damage incurred during shipping, we will refund the full cost of the merchandise. We will provide a pre-paid return shipping label for Non-Buyer's Remorse returns. All returns are subject to inspection, and if found not to be an error on our part, the return shipping costs will be withheld from your refund. SPECIAL RETURNS INSTRUCTIONS: The Seller cannot accept returns for used items. 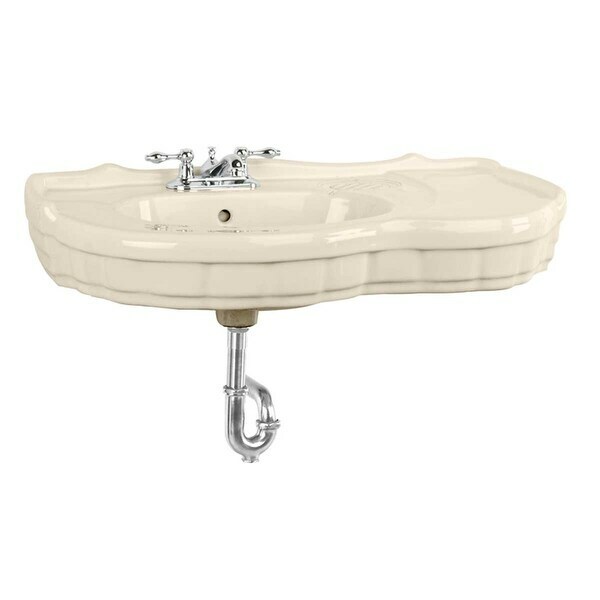 15457The Southern Belle console sink from Renovator's Supply features an elegant vintage design and durable scratch and stain resistant RENO-GLOSS finish. - The Southern Belle is a beautiful traditional console sink. - Console sinks give ample shelf space for toiletries. - Constructed from gorgeous Grade A vitreous china ceramic for durability and easy cleanup. - RENO-GLOSS finish protects from scratches and stains. - Authentic Renovator\'s Supply logo guarantees better quality than the knockoffs. Dimensions 19.75 In. X 33.38 In. X 7.5 In. "I too would like to know the dimensions. Overall dimensions plus the faucet hole location and drain in relation to the left side." "I would like to know the actual measurement of this sink from the wall to front apron. The measurements listed make it almost square and it does not appear to be in the picture. Looks more like 25" long by 14" or 16" deep from wall. Thanks!"